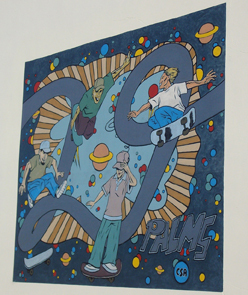 The Oasis of Murals in Twentynine Palms, California, was started in 1994 by a local Merchants Committee, which became the non-profit Action Council for 29 Palms, Inc., in 1995. 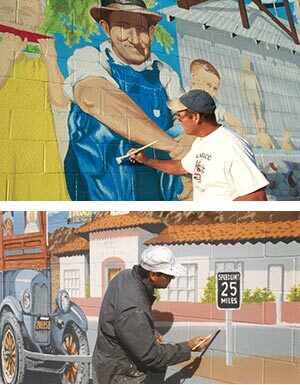 By 2014, they had commissioned 26 outdoor murals, illustrating the colorful history of Twentynine Palms and portraying the flora and fauna of the Mojave Desert and neighboring Joshua Tree National Park. The murals helped to spawn a renaissance in the community, creating new art events and art venues, attracting artists, and restoring a sense of community pride. Mural brochures and the Oasis of Murals book are available at the Twentynine Palms Visitor Center & Art Gallery and Chamber of Commerce. Bill & Francis Keys, Desert Queen Ranch by Dan Sawatzky, 1995. Early Oasis of Mara by Ron Croci & Robert Caughlan III, 1995, 29 Palms Liquor, 73777 29 Palms Hwy. Dr. James B. Luckie, Father of Twentynine Palms, by Don Gray, 1995, Eye Care Clinic, 6175 Adobe Road. Desert Storm Homecoming & Victory Parade by Chuck Caplinger, 1995, Desert Cycle Works, 6177 Adobe Road. Jack Cones, Flying Constable by Tim O’Connor, 1996, Cowboy Attic, 6308 Adobe Road. The Dirty Sock Camp by John Whytock, 1996, 29 Palms Thrift, 73911 29 Palms Hwy. William & Elizabeth Campbell by Richard Wyatt, 1996, 29 Palms Realty, 74017 29 Palms Hwy. Stellar Performance Automotive, 73339 29 Palms Hwy. Frank & Helen Bagley, The Bagley Store, by Dan & Janis Sawatzky, 1997, Historic Plaza. Bill & Prudie Underhill, The Desert Trail, by Susan Smith Evans, 1997, The Desert Trail, 6396 Adobe Road. 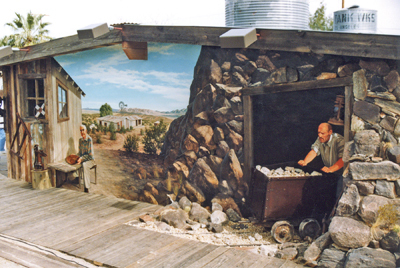 Desert Gold Mining Days, 3-D mural by Terry Waite & John Whytock, 1998, Joshua Park Mining Town, 6455 Mesquite Avenue. Flash Flood by Art Mortimer, 1998, 6248 Adobe Road. Desert Wildflowers by Dan Kelly, 2000, Hart’s Furniture, 73617 29 Palms Hwy. Valentine’s Day by John Pugh, 2000, Cowboy Attic, 6308 Adobe Road, north wall. The Sun Rises by Richard Wyatt, 2001, Little Church of the Desert, 6079 Adobe Road. 29 Palms Boys Basketball Tournament by Art Mortimer & Mural-In-A-Day team, 2002, Luckie Park, Racquetball Courts at Joe Davis Drive & Luckie Avenue. Good Times at Smith’s Ranch by Tim O’Connor, 2002, 6298 Adobe Road. Operation Iraqi Freedom by Don Gray, 2004, 6464 Adobe Road. Our Neighbors in Nature II by Larry & Nancy Eifert, 2006, Twentynine Palms Visitor Center and Chamber of Commerce at Bucklin Park, 73484 29 Palms Hwy. Battle of the Bell by Art Mortimer & Mural-In-A-Day team, 2007, Twentynine Palms High School, Mesquite Springs Road at Wildcat Way. Spirit of Mara, Makoto Hashigami, 2008, 29 Palms Inn, 73950 Inn Avenue off National Park Drive. 29 Palms Skateboard Park by Cristian S. Aluas, 2008, Luckie Park at Joe Davis Drive. 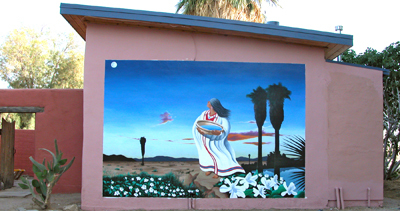 Keys’ Desert Queen Ranch II by Art Mortimer & Mural-In-A-Weekend team, 2013, 6348 Adobe Road. 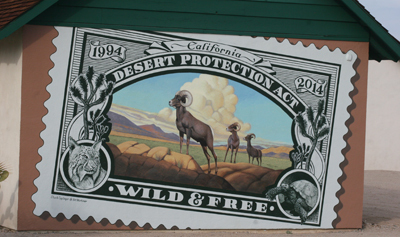 20th Anniversary of Joshua Tree National Park and California Desert Protection Act by Chuck Caplinger & Art Mortimer, 2014, Old Schoolhouse Museum, 6760 National Park Drive at Cottonwood Drive. Top bar: Roadrunner (“Dipsosaurus dorsalis”) and Lizard (“Grococcyx californianus”) murals by Chuck Caplinger, 2007, Smoketree Building and Farmers Insurance office, 72252 29 Palms Hwy.